Shortly before our homeschool year ends, I start researching fun kid-centered activities for my trio. Summer library programs, vacation Bible school, pool visits, and day trips often top my activities list, but I’m careful not to schedule too many activities outside the house. There are days when we just want to hang out at home rather than wage war against searing summer temperatures and crowded venues. The internet is one of the best places to find great summertime activities for kids. Online STEM activities are excellent choices because they’re both fun and educational. In addition, online STEM activities offer kids opportunities to complete interesting hands on projects while fine tuning their technical creativity. Would you like to offer your child a fun summer full of STEM? Check out this list of great websites! Camp Wonderopolis: This year Camp Wonderopolis invites kids to build their own version of Wonderocity by working their way through 42 lessons about engineering, construction, and city planning. As they complete activities, kids enhance their vocabulary, build background knowledge in science, strengthen reading comprehension, and boost critical thinking skills. Kids are invited to grab their hard hats and tool belts and head on over to Camp Wonderopolis for a summer of STEM themed fun. DIY.org: This is thriving online STEM community designed for kids ages 6-16. The site features a skills library with thousands of challenges organized into categories called Skill Patches. Once a child joins DIY, he or she can participate in challenges and even create a personalized portfolio to showcase creative works. Engineering is Elementary (EIE): This organization is driven by the belief that children are natural engineers. The site offers a variety of fun and engaging self paced unit studies for children in grades 3-8. Engineering Adventures features ten free unit studies for children in grades 3, 4, and 5, while Engineering Everywhere provides free unit studies for children in middle school. Maker Camp: If you’re new to STEM and are looking for your first foray into the maker community, Maker Camp is the place to start. Through a series of informative and funny videos, students gain inspiration to complete a variety of amazing projects and learn about careers in the STEM community. Follow along each day to learn more and then share the projects your kids create by heading over to Instagram using the hashtag #makercamp. The 2017 sign up begins on Monday, June 19. 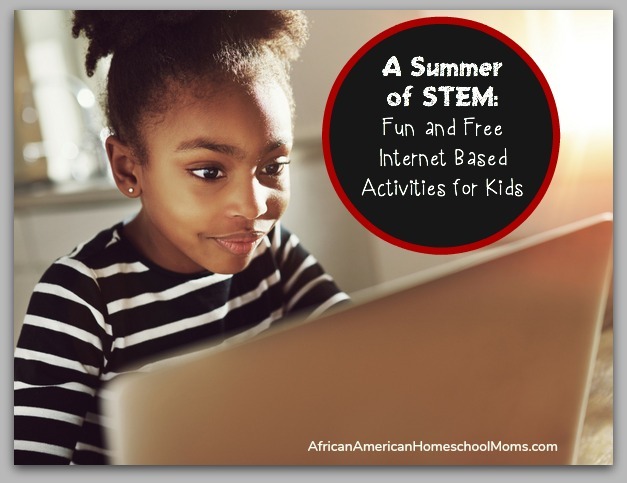 Summer is the perfect time for children to enjoy a leisurely exploration of STEM activities. The internet is home to many websites that will help children do so. Bookmark these websites today and return to them all throughout the summer! © 2017, Andrea Thorpe. All rights reserved.